There are millions of adults suffering with knee pain every day and every day that number grows. The older you are the more likely you are to develop knee pain. The majority of treatments only provide short-term relief. Unfortunately, it is just a matter of time until that knee pain returns, even after knee surgery. Women are more likely to develop knee pain more than men. 5 million people seek treatment for knee pain every year. 100 million Americans suffer from chronic knee pain. 1/3 of all Americans report experiencing knee pain at some time or another. The older you are the more likely you are to develop knee pain. There are no long term cures. Most Common Cause of Knee Pain? Younger adults suffer from ligament and tendon damage. This creates instability and misalignment within the knee. There is usually more pressure on the inner knee cartilage. The combination of knee instability and misalignment leads to excessive friction on the inner knee causing an inflammation repose. Chronic inflammation leads to cartilage destruction more commonly known as osteoarthritis. Osteoarthritis is the most common cause of knee pain in people 50 years or older. Nonsurgical treatments, including non-steroidal anti-inflammatory drugs, physical therapy, and intra-articular corticosteriod injections , could provide pain relief, but do not affect structural disease progression. These forms of treatment only mask the pain. They do not fix any underlying instability within the knee. They are associated with risks, are expensive and only temporary. There are more than 1.5 million procedures a year. No longer shown to be an effective form of treatment. Results up to 2 years failed to show benefits in pain or function, and excluded any but very small benefits. Over the long term, patients who undergo knee arthroscopy versus those who receive conservative management strategies do not have important benefits in pain or function. Many surgeons will advocate cutting the lower leg bone (tibia) to decrease the forces on the inner knee. The long term results show less than favorable results after a “big surgery. There are many risks and complications and a long recovery after this procedure. There were more than 1 million knee replacements in 2010. Risk for a variety of complications, such as infection, periprosthetic fracture, symptomatic implant loosening, and implant wear leading to mechanical failure. These complications substantially diminish the benefits of total knee replacement and often necessitate revision surgery. What Factor is Rarely Considered in the Treatment of Knee Pain? Misalignment of the hindfoot will lead to excessive strain on the knee. Every step taken leads to a recurrence of strain and damaging forces to the knee joint. Rarely will the patient also have symptoms or pain in their foot. The symptoms from the misaligned foot appear as knee pain. Misaligned feet is the leading cause of knee pain! The entire body rests on the ankle and heel bones. 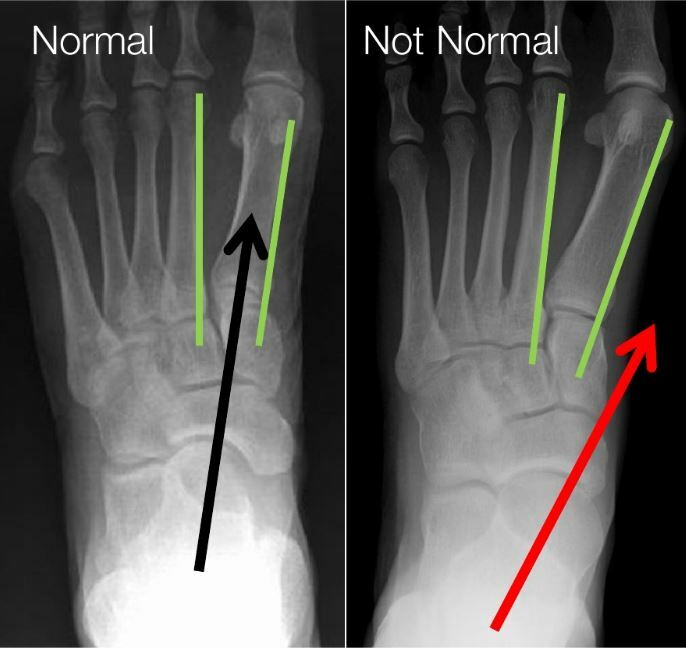 Their alignment and stability is what determines if the foot is stable and aligned or unstable and misaligned. 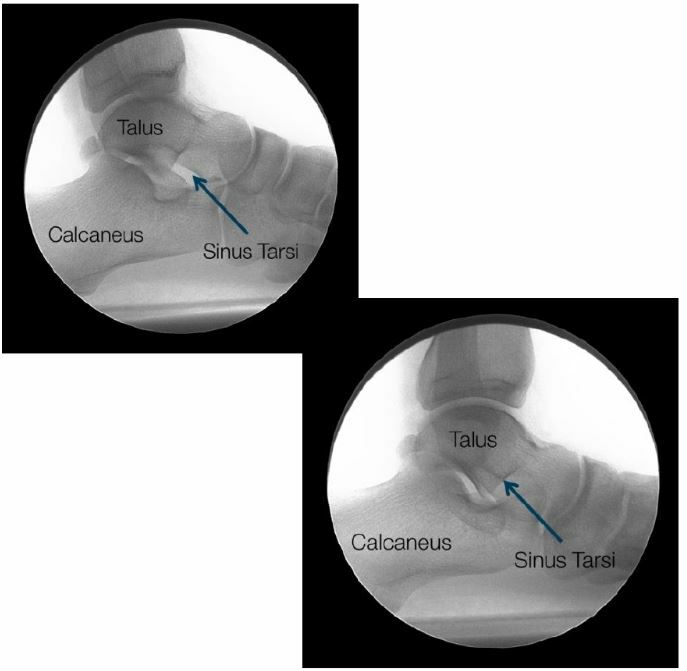 The ankle bone(talus) should be located on the top of the heel bone (calcaneus). Located between the two bones is a naturally occurring space called the sinus tarsi (tar-sigh). That sinus tarsi canal should always be in an open position. In order to know what’s wrong, we have to know what’s right. Here’s a side view of the foot. When we draw a bisection of the ankle bone, it should extend into the long metatarsal bone of the forefoot. Again, look at the sinus tarsi opening in between the ankle and heel bones. 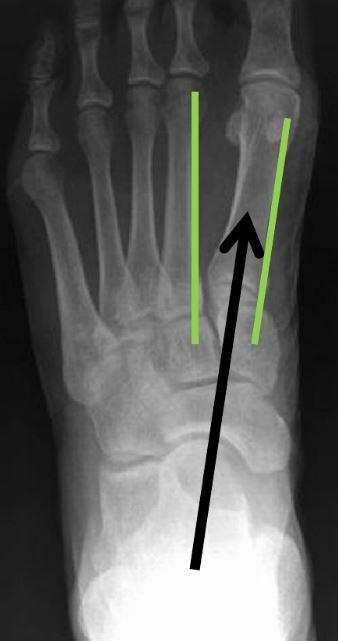 The bisection of the ankle bone (black arrow), should be aligned between the 1st and 2nd metatarsal bones. This is an excellent indication that the ankle bone is aligned and stable. This person does not have a bunion deformity and is not likely to develop one. Now lets compare an aligned hindfoot to a misaligned hindfoot. We first see that the sinus tarsi space is no longer in an open position. We also see that the bisection of the ankle bone no longer extends into the long 1st metatarsal bone of the forefoot. Both of those findings are enough to diagnose the patient with a partially dislocated ankle bone. 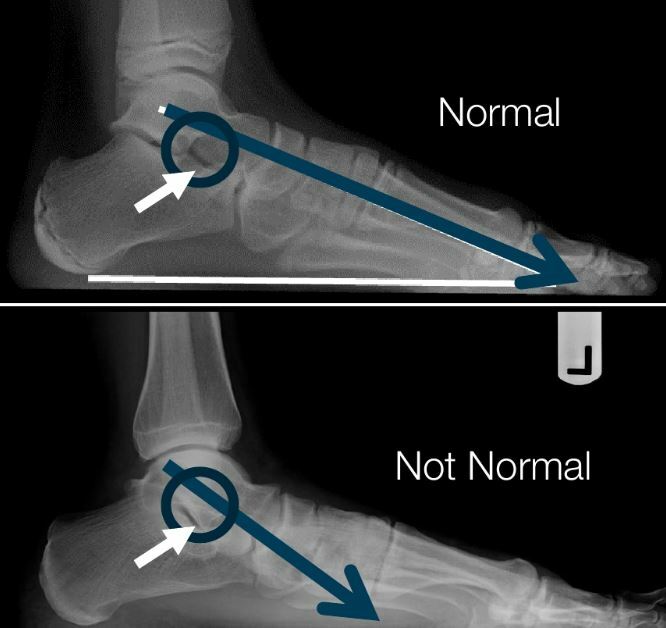 That means that the joints of the ankle and heel bones are not in their normal alignment. Here are 2 top to bottom view x-rays of an aligned and misaligned ankle bone. The bisection of the ankle bone (red) arrow does not extend in between the green lines. This turning inward of the ankle bone will close the sinus tarsi space. It unlocks the joints of the foot leading to weakness and further instability. There is a common condition where the ankle bone partially dislocates on the heel bone. This is something that one either has(born with), or doesn’t have, will never develop. 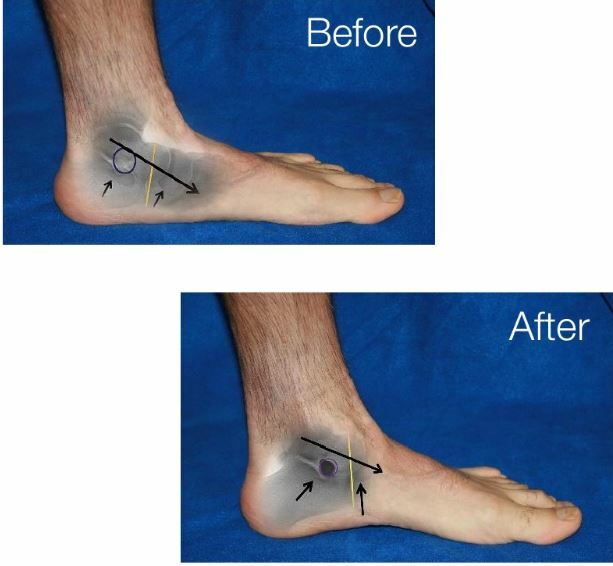 The ankle bone has displaced from its normal position and shifted forward and angle downward. This can be a flexible deformity, especially early in life. Eventally, it can become a fixed or rigid deformity, meaning the ankle bone cannot be placed back on the heel bone. Then you have it for good. These are x-rays of the same patient. The top view is the normal “relaxed” way the patient stands. You no longer see the open sinus tarsi. The joints of the ankle bone are no longer aligned. The bottom image was taken after the patient’s hindfoot was realigned. Now you can easily see the sinus tarsi space. The joints of the ankle bone are back into alignment and the patient has an arch again. 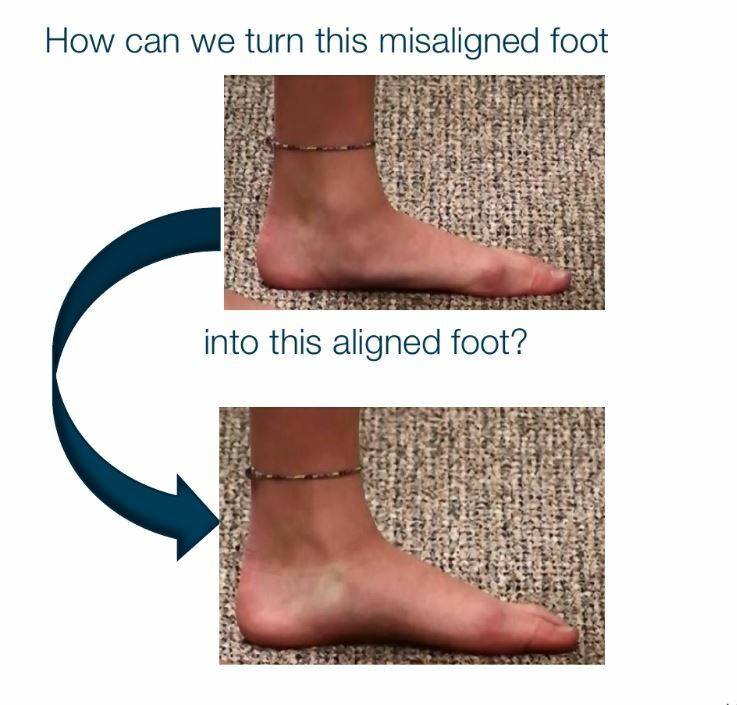 Now that you know what causes the foot to become misaligned – what can be done to fix it? There are many different opinions by various medical professionals as to the best form of treatment. It is very important to understand that each foot, and every patient, will have a unique set of circumstances . It is important that you seek guidance from a foot specialist. Only they can determine which options would make sense for your situation. There are amazing foot specialists out there waiting to help you! A misaligned and displaced ankle bone leads to excessive strain on the mid and forefoot. How can the ankle bone be realigned and stabilized? This has to be the first question to be asked and answered. The role of arch supports remains among one of the first lines of treatment. How exactly is an arch support supposed to work? To support the arch? That means that the arch support has to realign and stabilize the ankle bone, prevent the partial dislocation of the ankle bone. Arch supports cannot realign and stabilize the ankle bone. There are no scientific or radiographic studies that show ankle bone realignment with an arch support. 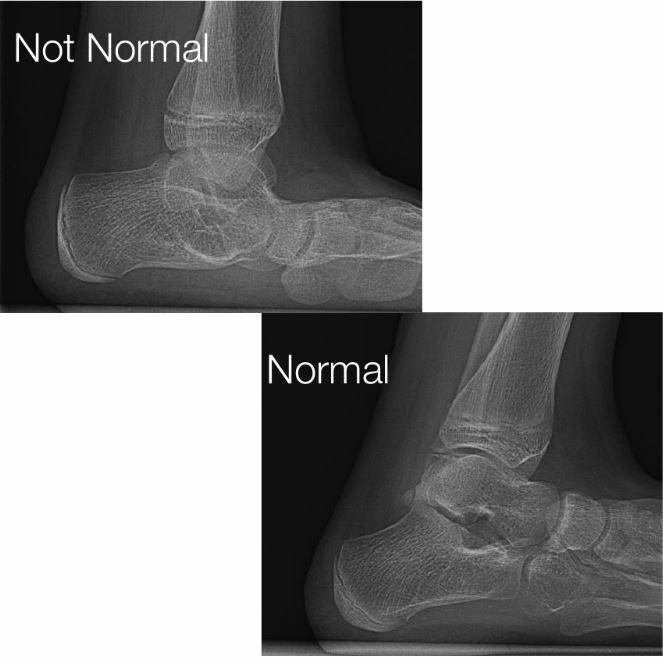 Arch supports do not address the underlying etiology: a displaced misaligned ankle bone. So How Can We Realign & Stabilize the Ankle Bone? Conservative, external measures cannot and have not been proven to realign and stabilize the ankle bone. There have been many aggressive internal surgical procedures that have been tried. Unfortunately, the cure can be worse than the disease with these options. These procedures are associated wit ha long recovery, many potential risks and complications. Most patients will have to be brought back to the operation room to remove painful pins or screws. There has to be a better option! There is a minimally invasive procedure, called extra-osseous talotarsal stabilization (EOTTS), where a small titanium stent is inserted in to the sinus tarsi space. This stent maintains the normal hindfoot alignment, while allowing the natural joint motion. Instantly, the ankle bone is realigned and stabilized. This instantly reduces the rearfoot acting on the forefoot. The HyProCure stent has the best success rate, 94%. On the other hand, “arthroereisis” implants have actual failure rates, up to 100%. HyProCure is the stent of choice by leading foot surgeons in > 70 countries. HyProCure fixes the underlying root-cause etiology. It is scientifically proven to reduce the excessive forces acting on the mid-and forefoot. Offers a long term solution for your misligned feet, unlike the other common solutions that are often tried by those who suffer from foot pain. This stent has been FDA cleared since 2004 and CE marked. In fact, it is used by leading foot and ankle surgeons in >70 countries. The stent is meant to be permanent, yet it is reversible. HyProCure is routinely used in both children and adults, to address other issues caused by ankle bone displacement. Most patients experience minimal pain and are allowed to bear weight on there feet the same day. Once fully recovered, patients are able to run, jump and participate in physical activities, allowing them to finally experience life pain free again. Unlike arch supports, HyProCure functions with or without shoes. Depending upon the severity of your condition, it is possible that you will be required to us an arch support to help other parts of your foot, or that you will require other surgical procedures to realign, repair, or stabilize other “broken” parts of the foot. The sooner you seek treatment, the more treatment options you will have. Do your body a favor and schedule an appointment today with a qualified foot specialist to see what options make the most sense for you. Refuse to let your misaligned feet affect your life! 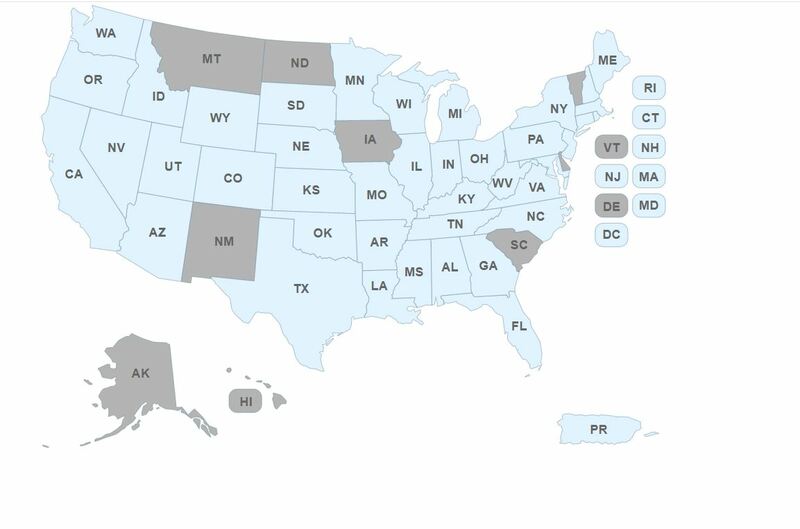 To find a HyProCure trained doctor near you, visit our doctor locator by clicking on the map below!